Kaija Anneli Saariaho (Finnish: [ˈkɑi̯jɑ ˈsɑːriɑho]; née Laakkonen, born 14 October 1952) is a Finnish composer based in Paris, France. You were not allowed to have pulse, or tonally oriented harmonies, or melodies. I don't want to write music through negations. Everything is permissible as long as it's done in good taste. In 1980, Saariaho went to the Darmstadt Summer Courses and attended a concert of the French spectralists Tristan Murail and Gerard Grisey. Hearing spectral music for the first time marked a profound shift in Saariaho's artistic direction. These experiences guided her decision to attend courses in computer music that were being given by IRCAM, the computer music research institute in Paris, by David Wessel, Jean-Baptiste Barrière, and Marc Battier. In 1982, she began work at IRCAM researching computer analyses of the sound-spectrum of individual notes produced by different instruments. She developed techniques for computer-assisted composition, experimented with musique concrète, and wrote her first pieces combining live performance with electronics. She also composed new works using IRCAM's CHANT synthesiser. Each of her Jardin Secret trilogy was created with the use of computer programs. Jardin secret I (1985), Jardin secret II (1986), and Nymphea (Jardin secret III) (1987). Her works with electronics were developed in collaboration with Jean-Baptiste Barrière, a composer, multimedia artist, and computer scientist who directed the IRCAM's department of musical research from 1984 to 1987. Saariaho and Barrière married in 1982. They have two children. In Paris, Saariaho developed an emphasis on slow transformations of dense masses of sound. Her first tape piece, Vers Le Blanc from 1982, and her orchestral and tape work, Verblendungen, are both constructed from a single transition: in Vers Le Blanc the transition is from one pitch cluster to another, while in Verblendungen, it is from loud to quiet. Verblendungen also uses a pair of visual ideas as its basis: a brush stroke which starts as a dense mark on the page and thins out into individual strands, and the word "verblendungen" itself, which means "dazzlements". ... the visual and the musical world are one to me ... Different senses, shades of colour, or textures and tones of light, even fragrances and sounds blend in my mind. They form a complete world in itself. ... I felt a connection between architecture and music: both art forms select and introduce materials, let them grow, give them form, prepare new contrasting elements, create different relations between the materials. [Kaija said:] 'There are so many kinds of percussion instruments which I do not know. I thought that it would be most interesting to see how the musicians choose their instruments in certain passages.' the identity and character of the composition remains the same even when the instruments are changed; each musical idea requires certain kinds of sound color but not a particular instrument. On 1 December 2016, the Metropolitan Opera gave its first performance of L'Amour de loin, the first opera by a female composer to be staged by the company since 1903, and the second opera by a female composer ever to be presented at the Metropolitan Opera. The subsequent transmission of the opera to cinema on 10 December 2016 as part of the Metropolitan Opera Live in HD series marked the first opera by a female composer, and the first opera conducted by a female conductor (Susanna Mälkki), in the series. 2008 – Musical America "Musician of the Year 2008"
2010 – invited by Walter Fink to be the 20th composer featured in the annual Komponistenporträt of the Rheingau Musik Festival; the second female composer after Sofia Gubaidulina. ^ "Kaija Saariaho (1952–)." Ondine (album label). N.p., n.d. Web. 20 Aug. 2015. <http://www.ondine.net/?cid=4.2&oid=614>. ^ Howard Posner. "Du cristal". Hollywood Bowl (website). Retrieved 5 November 2018. ^ "The CHANT Project: From the Synthesis of the Singing Voice to Synthesis in General". Rodet, Xavier; Potard, Yves; Barriere, Jean-Baptiste. Computer Music Journal, Vol. 8, No. 3 (Autumn, 1984), p. 30. The MIT Press. https://www.jstor.org/stable/3679810. Accessed 2015-08-19. ^ a b Cori Ellison (7 November 1999). "Uncovering Beauty in Ordinary Noise". New York Times. Retrieved 2 January 2017. ^ Saariaho, Kaija. Programme Note: Nymphéa (1987). New York: Commissioned by the Lincoln Center and Doris & Myron Beigler for the Kronos Quartet., 1987. Print. ^ Moisala, P. (2009). Kaija Saariaho. Urbana: University of Illinois Press. p. 55. ^ Moisala, Pirkko (2009). Kaija Saariaho. USA. p. 18. ISBN 978-0-252-03277-6. ^ a b c Moisala, Pirkko, 'Gender Negotiation of the Composer Kaija Saariaho in Finland: The Woman Composer as Nomadic Subject', in Music and Gender (Pirkko Moisala and Beverley Diamond, editors). University of Illinois Press (ISBN 978-0-252-02544-0), pp 166-188 (2000). ^ Tapio Ollikainen (Summer 2004). "Four measures of Kaija Saariaho". Universitats Helsingiensis. Retrieved 2 January 2017. ^ Mark Swed (2008). "The 2008 Honorees: Composer of the Year - Kaija Saariaho". Musical America. Retrieved 2 January 2017. ^ Wihuri Foundation (2009). "Kaija Saariaho". Retrieved 12 December 2017. ^ "Léonie Sonning Prize 2011: Kaija Saariaho". Léonie Sonnings Musikfond (Press release). May 2011. Retrieved 2 January 2017. ^ Tom Service (9 July 2012). "A guide to Kaija Saariaho's music". The Guardian. Retrieved 2 January 2017. 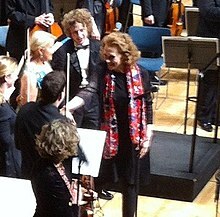 ^ "Kaija Saariaho: Laureate of the Polar Music Prize 2013". Polar Music Prize (Press release). August 2013. Retrieved 2 January 2017. ^ Robert Everett-Green (27 January 2012). "Kaija Saariaho is looking for love in Canada". The Globe and Mail. Toronto. Retrieved 3 February 2012. ^ "Kaija Saariaho gets lots of love for Love from Afar". The Toronto Star. 2 February 2012. Retrieved 3 February 2012. ^ Andrew Clements (26 March 2016). "Only the Sound Remains review - almost perversely unengaging". The Guardian. Retrieved 28 December 2016. Sanna Iitti: "Kaija Saariaho: Stylistic Development and Artistic Principles." International Alliance for Women in Music Journal, 2001. "Kaija Saariaho biography" (in French). IRCAM. Excerpts from sound archives of Saariaho's works. This page was last edited on 6 February 2019, at 13:28 (UTC).